That cut and burn and chill…. 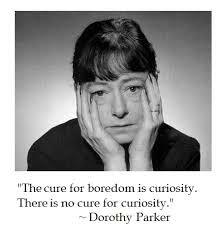 Dorothy Parker (1893-1967) was best-known as a caustic wit, a bon vivant poet, columnist and screenwriter, and later in a less-appreciated phase as an activist. (Perhaps she was not as jaded as she appears, though she was certainly depressive and cynical about how great modern life was.) Two favourite Wiki-facts: 1. The Portable Dorothy Parker remains in print; the only two others that did are The Portable Bible and The Portable Shakespeare. She DID have a way with words. 2. She left her estate to Dr. Martin Luther King Jr., and has a small monument in her honour near the headquarters of the National Association for the Advancement of Colored People (NAACP).